The clock is about to strike midnight on 2015 so it’s time to present our annual countdown of the top ten Penn games of the year. As always, the following are the most dramatic, memorable and important games played by Penn teams over the past 12 months (in one writer’s opinion — there were a lot of good ones to choose from this year!). For reference, here are the lists for last year and 2013. The men’s basketball team didn’t win too many close games last season but enjoyed this improbable victory in Ithaca. After falling behind 12-0 to start the game and 35-27 at the half, Penn chipped away at Cornell’s lead. High-scoring guard Tony Hicks, who’s since left the program, led the comeback with 20 of his 25 points in the second half, including the game-winning jumper that broke a tie with four seconds left and gave the Quakers a rare road victory. Despite losing to Columbia in the Ivy League Gehrig Division playoff for the second straight season, the Quakers won 22 games on the year, including this dramatic home sweep of Harvard. Penn managed to win both games of the doubleheader on its last at bat, winning the first on a walk-off base hit from junior outfielder Connor Betbeze in extra innings and the second on a hit from junior outfielder Gary Tesch. Penn’s pitching was also on point all day with senior southpaw Ronnie Glenn throwing nine nearly flawless innings in the opener. One of the first days of the calendar year produced one of the most thrilling finishes as then-senior Renee Busch hit a go-ahead three-pointer with 25 seconds remaining to lift the Quakers to a piece of their first-ever Big 5 title. Busch’s three came shortly after Temple tied the game at 48-48 with a three of its own and moments after Busch missed another chance to put Penn up in a game the Owls had led most of the way. Unfortunately, the Quakers couldn’t beat Temple a second time that season, falling to their Big 5 rivals in the second round of the WNIT in March. Down went the No. 1 team in the nation as Penn upset Harvard for the first time since 2008 for its seventh straight win to start the 2014-15 season. Freshmen Marie Stephan and Melissa Alves, sophomores Yan Xin Tan and Michelle Wong and senior captain Leslie Gill all won their matches to lift the Quakers to just their sixth win over Harvard ever. The narrow victory set the stage for Penn to capture its third Ivy League championship. 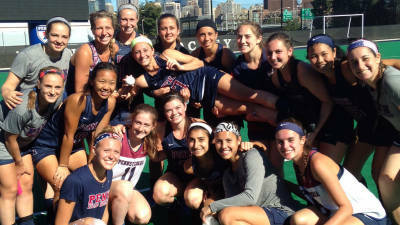 The Penn field hockey team played six overtime games this past year, winning four of them. But none were as meaningful as this double-OT triumph, which gave the Quakers their first nine-game winning streak in program history. Junior Elise Tilton scored her second game-winning goal in as many weeks and sophomore phenom Alexa Hoover (posing with the game ball below) scored earlier in the contest to set the program record for goals in a season. 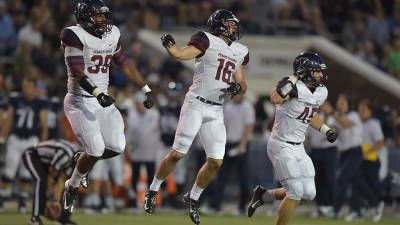 Known as the “Cardiac Quakers” in 2014, Penn was back to its old tricks in the second game of the 2015 season with a remarkable comeback. Trailing 7-0 in the first half and 9-4 heading into the fourth quarter, the Quakers scored six unanswered goals to take a 10-9 lead before the Hawks tied the game near the end of regulation. That set the stage for standout senior Nick Doktor to score the game-winner in OT and stun St. Joe’s on its own field. Now this is a cool way to win a championship. On the final day of the regular season, the Quakers rallied for a pair of one-run wins to lock up their fourth straight South Division title and a spot in the Ivy League Championship Series. In the first game, Penn overcame a two-run deficit in the fifth with sophomore Sydney Kranzmann tying the game on her first collegiate homer and junior Lauren Li scoring the winning run in the sixth. The comeback in the second game was even more impressive as Penn overcame a 7-2 deficit, scoring three runs in the sixth to take the lead and cap a memorable afternoon. It looked like Penn’s homecoming game would be spoiled when Princeton’s Nolan Bieck lined up for a 35-yard field goal at the end of regulation of a tie game. But Penn linebacker Donald Panciello blocked the kick as time expired and senior Eric Fiore caught a game-winning touchdown pass from quarterback Alek Torgersen in overtime to set off a huge celebration at Franklin Field. 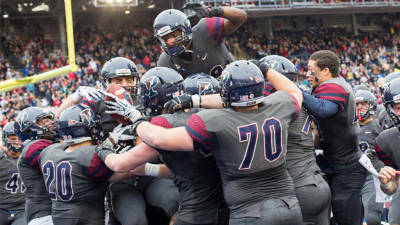 The win also kept Penn’s Ivy League title hopes alive (more on that below). What’s the only thing better than winning in overtime? Doing it in the NCAA tournament. That’s exactly what the Quakers did in the opening round of NCAAs as senior midfielder Lely DeSimone scored the game-winner on a free position with 3:27 left in OT and senior goalie Lucy Ferguson came up with a huge save with seconds remaining. DeSimone finished with a career-best four goals for Penn, which put up a good fight in a 13-10 loss to No. 4 Syracuse in the next round. It was a historic night on the Main Line as the Quakers stunned then-No. 4 Villanova for its first-ever win over a Top 5 team on the road and its first win over ’Nova in 104 years. The Quakers played an absolutely flawless first half to take a 14-0 lead into halftime and Panciello helped secure the win in the fourth quarter with a 90-yard fumble return for a touchdown. It’s hard to pick which of Penn’s two historic football upsets was better so we’ll put them both on the top. Few gave Penn a realistic chance to beat Harvard but the Quakers used one of the best offensive performances in school history to snap the Crimson’s 22-game winning streak and put themselves in position to capture a share of the Ivy title. Sophomore receiver Justin Watson led the way with a remarkable 249 all-purpose yards and a pair of long touchdowns as Penn won two road games over nationally ranked teams in the same season for the first time ever.